Today’s DIYers are looking to gain the most value from their hard work, gaining maximum benefit from the sweat, tears, and ingenuity it takes to remodel the home. Fortunately, modern homeowners have the benefit of shopping a vast array of quality home lighting fixtures to help illuminate the amazing results of any renovation. The large inventory of style options can be polarized as both positive and negative with the quality of choices and the intimidating number of options available. 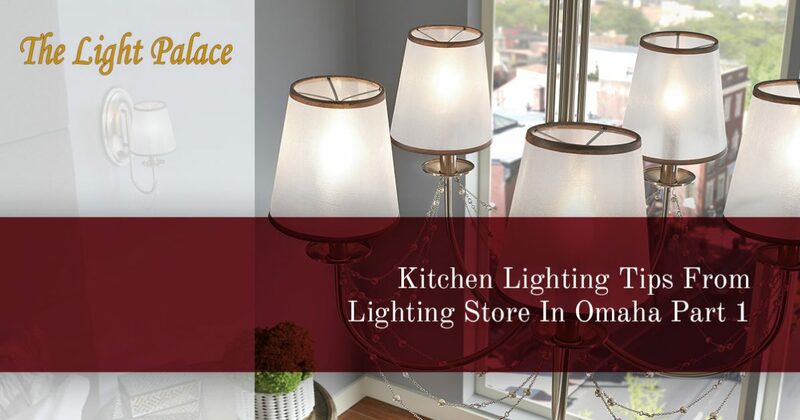 As your go-to lighting store in Omaha, The Light Palace is proud to display more than 5,000 residential lighting fixtures to help you find exactly what you need. Our 10,000 square foot lighting showroom has been in business since 1953, and we’re confident that we can help you create dynamic illumination solutions for your space. Our modern lighting services can help you light up each room in the house. Today, we’ll focus on kitchen lighting advice and general tips to help you hone in on your own method for upgrading the enjoyability and value of your cooking space. When you’re done reading, be sure to contact our Nebraska modern lighting experts for assistance! Where you place your kitchen lighting will help to determine the quality and consistency of your new lighting plan. As we have mentioned before, it’s important to incorporate different degrees of ambient, task, and accent lighting to ensure that you have a balanced illumination across the entire space. Kitchens are dynamic spaces, requiring different levels of lighting to accomplish different tasks. Therefore, we recommend planning your fixture locations in advance to achieve lighting at three different levels. Homeowners can work with our residential lighting experts to find the recessed lights, pendant lights, and under-cabinet lighting to cover your kitchen with the coverage needed to accomplish a variety of tasks. Downlights (or recessed lights) help provide the ambient illumination needed to bask the room with comfort and safety. Beyond helping with traffic control, the lights in your ceiling will also prove helpful for task lighting, providing assistance for activities such as cleaning and food prep. Down lights also work in tandem to minimize shadows and glare issues, creating a much more enjoyable space for everyone. Hanging lights, typically consisting of pendant lighting, bring illumination to surfaces such as tabletops, islands, and so on. Generally, this versatile fixture can be installed at different heights in the room, allowing for foot traffic safety while still being able to light up different surfaces. Different fixtures provide different benefits, so be sure to shop our lighting showroom in Omaha for the best outcome! Under-cabinet lights are handy for creating an ambient light along the countertops, providing a nice glow that helps in your activities without being overly intrusive or bright. These lights can also be installed in the lower cabinets, providing a soft glow at your feet. The design possibilities for your kitchen are vast, depending on your style and the layout of your space. Wall lights are one approach that can change the balance and dynamic of your space, providing soft lighting for the area while supplying a focused surface for displaying artwork, a favored appliance, or whatever you need to be highlighted. As long as the lighting is soft and does not create a glare in conjunction with other fixtures, you can install a wall light nearly anywhere you need one. The kitchen is a dynamic space that relies on proper lighting schemes in order to provide inviting, safe illumination for all of life’s tasks. Next time, we’ll continue on this topic by discussing more kitchen lighting tips to help inspire you for your home remodeling project. Our lighting store in Omaha has worked tirelessly over the past 65 years to create dynamic solutions for every home in Nebraska. Contact us today for assistance or stop by our showroom to get started!